The summer season of Drum Corps International’s SoundSport® division took off during the DCI Central Florida event on Saturday, hosted at Southeastern University in Lakeland. Two unique shows performed by Florida-based IMPACT Drum and Bugle Corps (Orlando) and Florida Xpress (Hawthorne), were inspired by SoundSport members’ personal input. As IMPACT’s first-ever competitive SoundSport event, members aimed to please the crowd with popular, feel-good music. The performance earned the group a silver rating and “Best in Show” honors. The team’s performance featured several small groups and soloists, including a tuba solo which was originally written for a baritone saxophone. 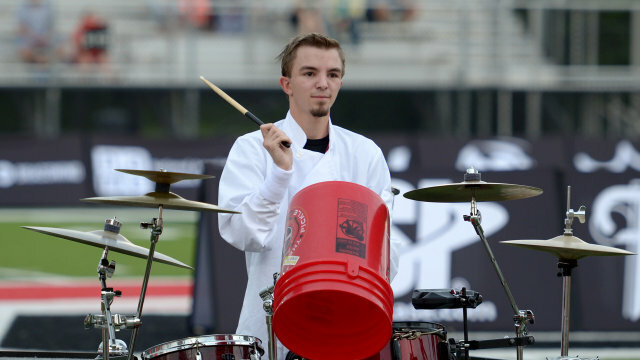 A Florida Xpress percussionist lays down a bucket drum beat. Florida Xpress earned a bronze rating with its performance that featured a bucket drum solo. It’s an idea that came from a member after a trip to a Firehouse Subs restaurant. The team is continuing its creative theme by building a vibraphone out of pots and pans. Morin said that members go to hardware and Goodwill stores in search of cookware with the perfect pitch. Upcoming SoundSport events will take place in Whitewater, Wisconsin (July 16), San Antonio (July 23), Atlanta (July 30) and at the DCI World Championship in Indianapolis on August 13 during the all-new SoundSport International Music and Food Festival.